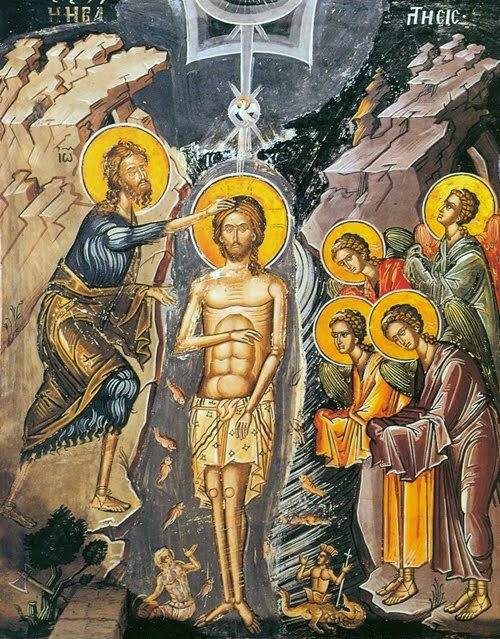 The third day of the Forefeast of Theophany falls on January 4. The hymns compare the Feast of the Nativity with the coming Feast. "There shepherds saw the Child and were amazed; here the voice of the Father proclaims the only-begotten Son." From the Church hymns for this day: "The feast of light is accomplished before all in the Theophany of Christ", "come to the Jordan, let us assemble to be cleansed and to sing the Forefeast". "Leave Bethlehem for the country of Jordan, you who delight in wonders, and there you will see deeds mysteriously accomplished": "Jesus the King of all the earth", "Son of Father without Beginning", "as a man in essence, not in fantasy", "coming humbly to the son of Zechariah", "requesting baptism". "Receive in a manner fitting a slave, O Prophet John, the Deliverer of the world, and baptize the Creator for the rebirth of mortals". "Let the mountains leap for joy, let the hills vest themselves in joy, let the corrupted be prepared for divine cleansing". "Awaken O Soul, to be cleansed of passions, blossoming through offering good deeds".